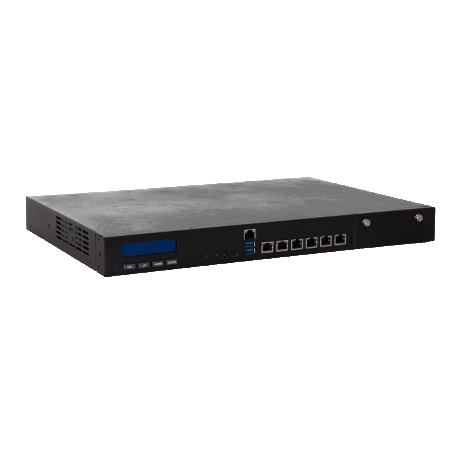 The SecPoint Protector is a UTM (Unified Threat Management) appliance designed to protect your whole network in every way possible. Secure & protect your network from remote and local attacks. The Protector Cyber Security Solution features the best Anti Spam with less false positives. Protector solves your entire network's spam and security problems with just one appliance! The Advanced Anti Spam allows full scanning of the mails. Scanning both incoming and outgoing direction. Easy quarantine user management for individual users. High Powerful 64 Bit Multi Core architecture. Optimize and prioritize your traffic with the Bandwidth Management module. Best Anti Virus Scanning with multiple engines for most comprehensive scanning. Web Proxy and Web Filtering. Best Cyber Security Protection for the entire network. For pricing please click here for our web store. Multiple Anti Virus engines: ESET, ClamAV, Kaspersky. Spam scanning based on the whole mail content. Content Filter to block P2P, VoIP, Games etc. The Protector is an all-in-one solution, with a high number of features at a single price. The Protector is actively developed, with an eye to the customers' direct requirements. We do new big software updates, also built on some customers' requirements. Nobody of bigger competitors develop the customers' specific requirements on projects. IPS Intrusion Prevention Module can block SCADA and other services attacks. No software limits for performance or locking of VPN tunnels. Only limited to Hardware specs and on virtual to CPUs. Cost effective. All modules are included at 1 cost, with support and updates. All Data is only at customer site - No Data collected. No backdoors. Fast deployment with setup wizard guides. Blocks both local and external threats. It comes with advanced Anti Virus, Anti Spam. Web Filtering with grouping policy. Full Microsoft Active Directory LDAP Integration. Next Generation Firewall with VPN. The Web Filter can block Social Media websites (Facebook, Twitter, Linkedin etc.) based on site name. Easy to install as an appliance solution or you can deploy as a Virtual software version. 64 Bit system architecture for Appliance and Virtual version. Full mail Archive: stores all incoming and outgoing mails on the hard drive. The Protector is a Unified Threat Management solution with a multi-featured email threat protection. It can stop viruses, Trojans, Spyware and other Malware. Integrated with ESET and Kaspersky Anti-Virus engines, SecPoint provide best Virus Protection. The Protector comes with fully loaded email server, so you can save cost for local mail server. IMAP / Webmail / POP3 support - Multi layer Email Protection. Deploy the Protector UTM Firewall as a Microsoft Hyper-V 2.0 or 3.0 Image. Works for Hyper-V 2008 and earlier. Also works on Hyper-V 2012 R2 and newer. With Advanced Anti Spam you get state of the art with full scanning. You can easily release mails from quarantine, see the content of the mails. Automatic heartbeat synchronization for High Availability. Connect more Protector units together for maximum stability and security. If one unit fails the other unit can automatically take over as master unit. See the video of the Protector UTM Appliance - 3 Anti Virus engines Scanners running at once. Scan your mails with Kaspersky, ESET and ClamAV. ESET, Kaspersky are rated in the top of commercial Anti Virus vendors. When combining with the best Open Source Anti Virus Vendor ClamAV it gives the customer the best overall security scanning for virus. You can enable all 3 scanning vendors at the same time to make sure all your emails both incoming and outgoing get cleaned for any virus, malware, spyware or worms. It is recommended to run with all 3 vendors enabled at the same time. It is easy to enable all 3x anti virus scanners at the same time: upload the license keys or type the key code.Once it has been activated it just requires few clicks to enable. The Anti Virus scanning will happen automatically. You can also just run with the open source ClamAV if you do not want the extra cost for the commercial Anti Virus vendors. The SecPoint Unified Threat Management (UTM) Appliance known as the SecPoint Protector provides the following perks that will help ensure your network's safety: Content Filtering, Wi-Fi Defender, Next Generation Web Filtering, Anti-Virus, Anti-Spam, VPN, Firewall Appliance and Firewall features. It works under the school of thought wherein the fewer harmful malware could enter your system, the less likely it would get compromised. SecPoint Protector is "unified" in the sense that it offers services that are traditionally standalone under one jam-packed device. People usually avail of their firewall, antivirus, and Wi-Fi security solutions separately. The Protector is a better option because all these services can actually work hand-in-hand in defeating the threats regularly found on the Internet. Every last attribute and service of this UTM device is well-coordinated in achieving their goals. There are some security programs that tend to slow your computer down if you run them all at the same time. There are also times when your firewall software will insist on becoming your anti-spam and anti-virus provider as well, thus causing problems with your existing anti-virus and anti-spam solutions. You won't be facing such difficulties with the UTM protection scheme of the SecPoint Protector. Every software and app within this appliance has been specifically developed to work together in order to individually focus on the threats they're supposed to get rid of without getting in each other's way. This is significant because this helps reduce instances of system resource hogging thanks to competing security programs. UTM is the perfect solution when it comes to managing your defender apps and security measures. What's more, while SecPoint is hardly the first or last UTM appliance provider, they're even better than the closest competition simply because they handle threats in a more specialized manner. Instead of a firewall doubling as an antivirus or vice-versa, the SecPoint Protector deals with threats one at a time, so you're assured of premium-grade, concentrated protection that's thorough and doesn't let one iota of spam, viruses, botnets, worms, Trojans, spyware, and other types of malware to invade your system and turn it upside-down. Most companies attempt to be jacks-of-all-trades, trying to do a hundred things at the same time, yet are unable to master any of them. Meanwhile, SecPoint specializes in dealing with each and every last threat, so you're assured of quality software defense all-throughout that's fully focused. See Video with Protector UTM Firewall that gives you complete UTM. You can easily install it on your network and get complete network layer 7 protection. Is the SecPoint Protector UTM Firewall the right solution for me? SecPoint Protector provides full protection of your whole network with complete security UTM Firewall. It will secure incoming and outgoing traffic to your network, prevent and secure Spam,Virus,Hackers,Worms from entering your network! Protector secures your network from spam, virus and security problems for the entire network with a single, specifically designed, appliance! Can I set different groups on the web filter? Yes you can set group policies so that management has one policy and another department another. Is there individual anti spam quarantine for users on Protector? Yes each user can login individually and manage their anti spam. Do I get firewall and VPN? You get: Firewall and IPsec / SSL / PPTP VPN tunneling. Where can I see Protector Firewall Appliance customer references & testimonials? Which mail servers can I use with the Protector? It works with Microsoft Exchange, Linux Sendmail, Lotus Domino basically any mail server. How do I install the Protector on the network? The Protector runs in Bridge mode so it is very easy to install. It must be placed on the local network just in front of the network. It has 2 network ports, so in the first port you put the Internet connection,firewall or router. And in the second port you put the switch from the local LAN. You know right away if it works or not since you can see traffic passes through it. Can be placed in any network environment, in Bridge between the master router and the network to protect. Read more about Ransomware and how to protect your site from it. Anti-spam software is a type of software that's been specifically developed to stop the spread of unsolicited junk email, otherwise known as spam. There are two kinds of this email-filtering program. The first type of anti-spam application stops spam email from coming through care of an email reader. An email reader is capable of analyzing the header of a message-which is the part of the email that lists who the sender is-as well as the content of the email itself. It then removes any correspondences that the user has indicated as possible spam by comparing the material found within the email with a list of known spammers' addresses, phrases, keywords, and the like. The second type of anti-spam software deals with scanning a mail (typically SMTP) server before the emails can even get to you; as such, you're protected from spam scams or spam with attachments containing exploits or viruses without even setting up an email reader to catch keywords or content for you. This anti-spam filter works best in a corporate environment, because it's quite literally capable of blocking hundreds of thousands or even millions of spam a day, while a personal email account of any one individual can be adequately safeguarded by a simple email reader "word filter" of sorts. One advantage that the email reader filter has over the mail server filter is the fact that it provides the user a lot more control. However, for people who'd rather not deal with spam altogether, the mail server option is the most logical choice for them.Whenever spam is spotted by the email reader anti-spam filter, it simply puts it in a special folder which the user can browse or ignore at his behest. If left alone, the spam folder automatically deletes its contents after a certain period of time. In turn, anti-spam software using the mail server filtering method should be used carefully because such programs are known to auto-delete even legitimate mail that's been erroneously labeled as spam. More information on Protector Firewall here. Due to the fast CPU it does deep scanning of mails and running multiple Anti Virus Scanners. The word 'spam' is not a very common one. It is primarily associated with an internet technique in which a person sends a large amount of unsolicited messages to an individual, or a network. Take a look through the 'Junk' section of your email inbox, and you will realize that the number of sheer 'spam' messages that you receive are automatically filtered by your email service. However, when you consider the case of large scale networks, it becomes even more difficult to prevent large scale network spamming threats. As a result, companies have to make use of advanced anti spam measures in order to prevent unauthorized access to their networks. How does advanced anti spam work? Advanced anti spam works in a number of different ways. There are sophisticated filters that are used in order to prevent spam messages from entering the system. Advanced anti spam filters use automatic codes in order to set up barriers which prevent any sort of unauthorized messages from entering the system. There are sophisticated scripts that are used to prevent any sort of spam from entering. However, the word 'spam' doesn't just refer to the use of unauthorized sending of random messages. The word is also used to refer to spam attacks, which are sent to users and companies in order to bring down their networks. Network spamming is a very common term that is used by hackers and the technological community, and refers to the use of unauthorized tactics that are used to overload the systems and then gain access to the systems in order to steal important information. Advanced anti spam techniques are used in order to prevent such attacks, and there are a number of different ways by which this can be done. Advanced anti spam techniques include the installation of a high power anti spamming tool/ software program that is useful for preventing such attacks. Anti phishing and anti spamming software programs carefully scan each email along with the attachments in order to determine whether they contain any sort of compromising information or not. If they do, the program automatically filters that email. You can easily check the contents of the email, but since the program restricts the program from making any sort of changes to the computer or server, your network remains safe and sound. Should you buy advanced anti spam? For people who avidly use their internet email in order to send and receive messages and coordinate with strangers, making use of advanced anti spam software programs is of vital importance. These programs are designed to help a person's correspondence by providing them with a secure medium to send emails and messages. If there are viruses or spy ware attached to the email that you are actively sending, it could potentially track your computer, or harm it permanently. As a result, making use of an advanced anti spam software program is vital to ensure the safety of your network and your correspondence. With so many advanced anti spam programs available, it is to your best interests that you get expert advice before finalizing the purchase. However, one important tip to keep in mind is to first get in touch with professionals who have to deal with spam on a daily basis. They will be able to guide you better regarding the best possible program to buy. An anti-virus, otherwise spelled as antivirus, is a security application or program feature that's used to remove, detect, and prevent the proliferation of malicious software into your system, which may include Trojan horses, worms, viruses, botnets, and so on. This type of protective software could also be employed to thwart and eliminate spyware, adware, and practically any program that's viewed as a nuisance to the user's computing experience regardless if it's intentionally programmed to do so or not. By an anti-virus whenever it accomplishes its malware-related tasks. For instance, this type of security tool may use signature-based detection, which involves looking for known malicious strings within an application's programming code.However, it's very possible for a user to be attacked by a new form of malware where no identifiable patterns or signatures exist (otherwise known as zero-day threats). Ergo, it's always the prerogative of both the anti-virus program and the user to get the latest virus definitions and updates. For added protection, it'd also be prudent to keep yourself updated in regards to the latest threats presently plaguing the worldwide web through IT security websites found online as well as email updates from the anti-virus vendor that sold you your anti-virus program. A tech-savvy user would never merely rely on a propriety or freeware anti-virus application when protecting his machine; good user habits and a well-updated security application should go hand-in-hand in battling against the malware menace. New threats that have not been identified and included in the virus and malware definitions of your anti-virus software can also be mitigated via heuristics-based anti-virus programs. In fact, the heuristic approach known as generic signatures was specifically developed to expose new viruses or existing malware variations by looking for even the slightest hint of malicious code (and its respective variants) in files.The most advanced anti-viruses in the market could even predict what an infected file would do if it's allowed to execute via sandbox emulation, which helps a lot in analyzing an infection's threat level without necessarily letting it loose on an actual system. If the emulated file does anything remotely dangerous inside the sandbox, it would then be dealt with accordingly.